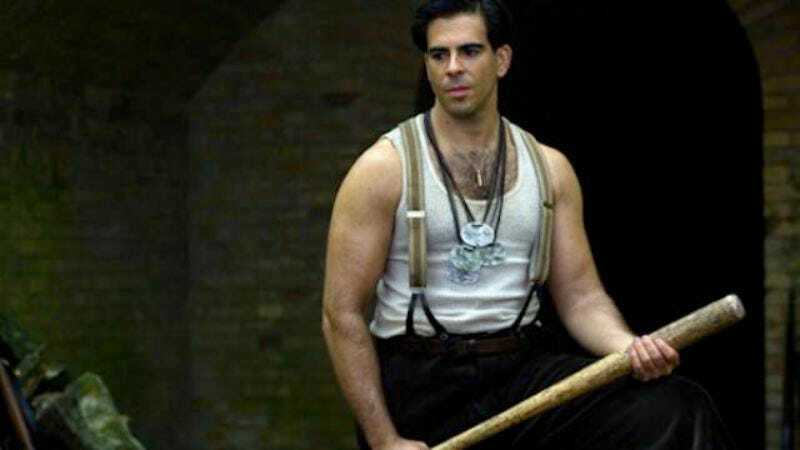 Noted shark fan Eli Roth is apparently in talks to revive a long-planned monster movie about a team of men battling against a 60-foot underwater beast. The film in question, mired in development hell for nearly 20 years, is an adaptation of Steve Alten’s 1997 novel Meg—short, in this case, for Megalodon, a gigantic ancestor of the modern shark, and not, say, Margaret, a hypothetical well-bred lady of means. (Dinner party guests are advised not to confuse the two, as it can lead to embarrassment, hurt feelings, or being messily devoured by a shark.) Disney originally purchased the rights to the book shortly after its publication, but ultimately shelved the project after losing the great race to be 1997’s premier terrible shark movie to Renny Harlin’s Deep Blue Sea. Roth’s affinity and affection for relentless, cold-blooded murder monsters is well known; he previously signed on to host a show for Discovery Channel’s upcoming Shark Week, which observant Sharkitarians will know is coming up at the start of July. If he signs on for Meg (new title pending, if God is kind), he’ll be working from a script by Dean Georgaris, adapting Alten’s novel about a pair of men who must stop a race of prehistoric super-sharks from escaping the Marianas Trench and menacing the Chinese coast. A prolific author of science-fiction tinged thrillers, Alten’s other books include The Omega Factor, which sounds like a fake movie from Seinfeld, and The Loch, which features a battle between a disgraced marine biologist and the Knights Templar, an old order of European knights founded in the Middle Ages to provide bad guys for trashy summer beach books. He’s also written a number of other novels in the Meg series, which makes us cross our fingers in the hope that Roth’s movie beats the odds and wins big at the box office, because that’s the only way Meg 4: Hell’s Aquarium is ever going to get made.